SINGAPORE-based Petroleum Specialties Pte Ltd (PSPL), a fully-owned subsidiary of Apar Industries Limited, has announced it will set up a manufacturing unit at Hamriyah Free Zone. Apar Industries is the largest manufacturer of transformer oil, white oils, rubber process oils and lubricants (industrial and automotive) in India and has the GCC region and Africa accounting for a significantly large portion of its export revenues. The company has evolved into a $850 million diversified operation offering value-added products and services in power transmission conductors, petroleum specialities and power cables. The group accounts for about 50 per cent of India’s transformer oils market and about 22 per cent of its aluminium conductor market. “We are keen to set up a manufacturing unit at Hamriyah Free Zone which can cater to the African/Mena market and help in expanding our reach to the CIS countries,” said Kushal Desai, managing director of Apar Industries. 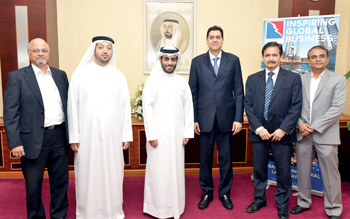 “The Hamriyah Free Zone Authority (HFZA) has extended extensive support to us and PSPL has been awarded 30,000 sq m of land in the free zone to develop the facility and we plan to complete the project by December 2015” said Sanjay Abhyankar, senior vice president of Apar Industries and project manager for the project. “We are moving to Hamriyah Free Zone due to its strategic location and as per the recommendation of our business associates Rchemie International FZC which already has a base in HFZA” he said. “Currently Apar Industries, which is listed on the Bombay Stock Exchange, exports specialty oils to more than 70 countries.” Abhyankar remarked. An agreement for setting up the plant was signed with Sheikh Khalid bin Abdullah bin Sultan Al Qasimi, chairman of HFZA, Sharjah Airport International Free Zone (Saif Zone) and the Sharjah Sea Ports and Customs Department. Desai signed on behalf of the group. Present at the signing ceremony were Saud Al Mazrouei, director of HFZA and Saif Zone, and Abhyankar, as well as Shirish Patwardhan, Rchemie International FZC’s executive director, and its director of operations, Sanjit Ghate, among other top officials. “Our goal is creating a robust business environment by meeting the needs and demands of our investors,” said Al Mazrouei while welcoming the fourth largest manufacturer of transformer oils in the world to HFZA. Hamriyah Free Zone houses 6,000 companies from across 155 nations, welcoming foreign investment from more than 500 industries in the key sectors of oil and gas, petrochemicals, maritime, steel, construction and food.